An exceptional creation… of human origin! A new portrayal of ET! While the number of crop circles has become slightly higher in England (about forty versus thirty or so in 2015), the number of creations reported round the world has been lower (53 versus 60 or so in 2015). 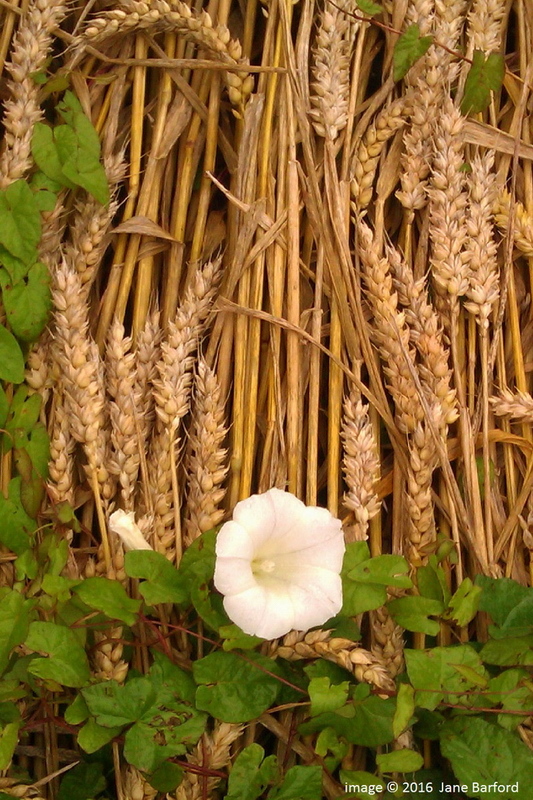 Remember that such figures do not necessarily represent the actual number of works in the season, but only the number of creations that have been reported to the editors of the website Crop Circle Connector. 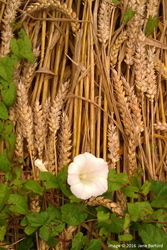 In Wiltshire the first creation was seen on May 6th (in a colza field) and the last one on August 24th (in a wheat field). 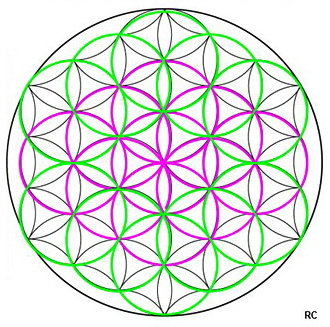 It is a typical pattern of sacred geometry (photos 1 and 2). Under its most frequent traditional guise, the flower of life is made of 19 interwoven circles, the centre of each circle being located along the periphery of the neighboring circles (with the symbol of Vesica Piscis, formed by the 2 intersecting neighboring circles). This creation is outstanding as 9 circles have been represented here. The main teaching of 2016 about crop circles is that it has become impossible - in the light of air photos only - to distinguish the genuine creations (the non human ones) from those created by men. The circlemakers have honed their technique and the human creations can now be very sophisticated and complex. The one found on August 12th 2016 (photo 3) in the small village of Ansty (Wiltshire) perfectly illustrates this. It is a magnificent large-sized (110 m in diameter) creation. All the witnesses were amazed at its complexity and fine patterns, and it is hard to think at first sight, that this can have been produced by men. The patterns inside are geometric whereas the outer part has got something new in it: a whole string of totally novel characters reminding one of an unknown alphabet. the only real message, written in English, yet in ASCII (a coding system in computing) was the message produced at Crabwood in 2002, yet it doesn't belong to the same class of crop circles and doesn't fall within the same origin as all those made of geometric patterns (see the page “Who are they?”). It has been recognized that the whole design at Ansty is very similar to the logo of a small American company called “Mothership Glass” (photo 4) that makes and markets decorated glass items! 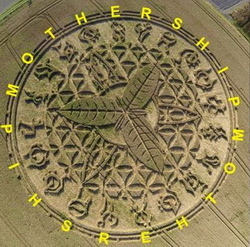 The letters in the name MOTHERSHIP, around the logo, have been replaced in the glyph by those enigmatic signs (photo 5). 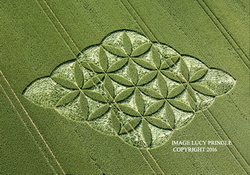 This is the first time a crop circle pattern has looked so much like a disguised advert! 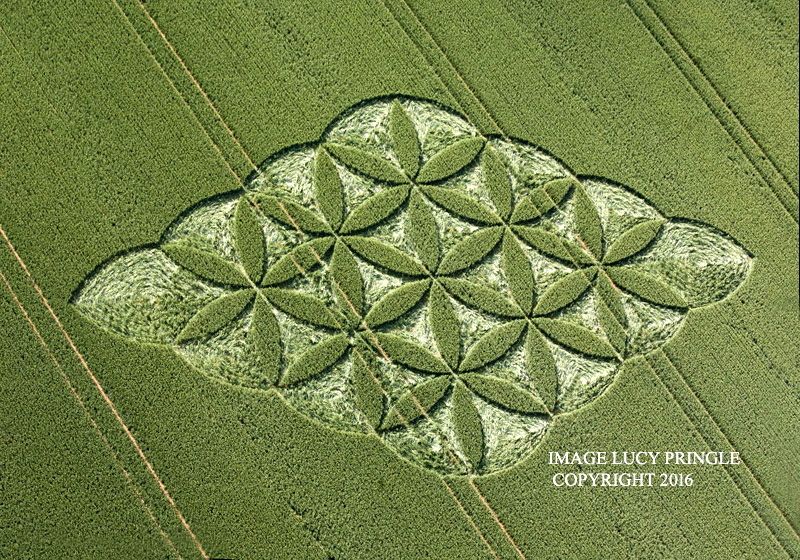 Now a survey made by Colin Andrews, a highly esteemed pioneer for crop circles researchers in England, has come to the conclusion that production was made in three days by a team of circlemakers artists he is acquainted with. See his survey report. Another survey was made by Linda Moulton Howe, a famous American investigative journalist, specialized in phenomena of UFO, crop circles and animal mutilations types. 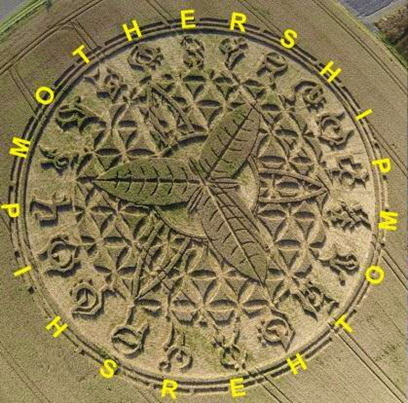 She could certify that all the signs represented around the Ansty pattern corresponding to the word MOTHERSHIP were the exact copy found on glass items made by the American company “Mothership glass” and presented to the public in July 2016. We can ascertain with the glyph that the signs corresponding to the 4 H letters are quite similar. Such an additional observation and the similarity between the Ansty pattern and the logo of the company reveal there's a real connection between the crop circle and the American company, and thus that it has been very likely been worked out by men. 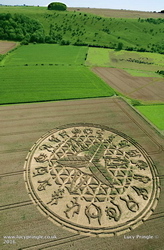 Such a crop circle happens to have been found on a farm that had built mazes in corn fields for the purposes of advertising in previous years. 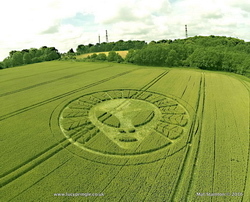 That particular crop circle had been made by a group of 8 people in July and until the beginning of August, according to the investigation led in that area by a partner of Linda Moulton Howe's who could interview the villagers. One villager stated that first, 8 men had been working with headlamps, electric torches fixed on poles and lasers during three nights. They had later worked for two weeks after during the daylight as a team of 2 or 3. A revealing piece of evidence: some photos that had been taken after the crop circle had been reported (August 12th), show that weeds had grown upon the corn flattened on the ground (photo 6). This piece of evidence shows that the corn had been already flattened on the ground some time before the camera work! ln all likelihood, the making of that crop circle had been financed to promotional ends by the company Mothership Glass. However, few people have been informed about these investigations, so that all ended up in making people even more confused about a topic that is already confusing for most of them. It also seems that the means used by the “circlemakers” have greatly developed over the last years. Their tools are no longer limited to mere boards or rollers to fold or flatten the plants underneath. As a consequence, it has become very hard to tell the real copcircles (the genuine ones) from the fake ones (those of human origin). One may wonder whether such an insistence from the circlemakers' part upon sowing doubts and confusion in people's minds about crop circles, isn't one reason why the number of crop circles has decreased so much since 2013, in comparison with the years before. Yet, we must keep in mind that the “real” crop circles do exist for many reasons that have been widely developed before. 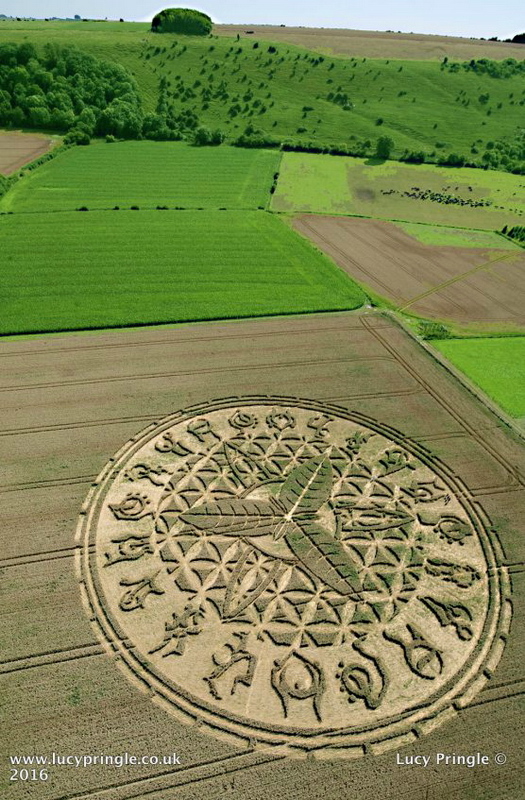 We must also realize that whereas the Ansty pattern was made in about 2 weeks by a team of 8 men, all the genuine crop circles have been achieved in a few seconds (according to many an eyewitness). This is another creation that sows confusion but that is non-human here and therefore genuine: the caricature of an extraterrestrial face (photo 7), as it is seen in the media, was found in a field at Reigate Hill, Surrey, on July 19th 2016. It may be of interest to point out that such a creation was made in the suburbs of London and not in Wiltshire like most of the other ones. It is not the first time, far from it, that the caricature of ET has been represented as a crop circle. Although surprising, the former representations (photo 8) were also genuine ones. We can acknowledge here the mocking trait of the beings of nature, in their awareness that the landscaped works of art through which they have been trying for years to question men, have not been grasped by them yet. In fact, people keep on believing in an extraterrestrial hypothesis and don't take a second thought at it. So they feel like making fun at them… with representing precisely what they want to see.